Tomorrow starts the Month of May and if you thought April was busy, May is twice as crazy! So much is going on starting with Cinco de Mayo (it really starts on Friday and continues until Monday); in addition are numerous festivals, music performances, exhibits, Mother’s Day (order flowers today), yard sales, recitals, school awards dinners, graduation (order signs now!!) and a host of other activities before we get to Memorial Day when summer really begins. No doubt this issue has more than you will care to read at one time, so stow it in a safe place on your computer or simply go to the website blog page www.lilburncp.com to retrieve an issue. Also, feel free to post to the Community Bulletin Board on the website items such as your subdivision's pool membership drive, summer camp information, swim /tennis team news, yard sales in the area or volunteer needs. Send us photos of clean-up efforts or your flower and vegetable gardens, and don't be shy about sending us an article or two - info@lilburncp.com. Happy May! Advance in-person voting for the May 20th Primary started Monday, April 28 at the Elections Office located at 455 Grayson Highway, Suite 200, Lawrenceville 30046. Advance voting starts May 10 at satellite locations. For a more detailed schedule, address info, and voter registration cllick on this LINK. The Gwinnett Historic Courthouse is pleased to offer an exhibit by glass sculptor, Hung Nguyen from May 1 – July 31, 2014 with an artist reception on April 30 from 6 p.m. – 7 p.m. to offer an opportunity to view his work and meet Mr. Nguyen. 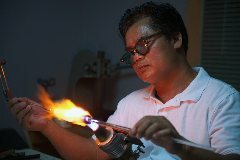 For more than 27 years, Nguyen has been recognized for his exceptional skills in creating outstanding glass art pieces and earned him the title of Master of Glass Art. His artwork has been acquired by admirers such as President George Bush, Mikhail Gorbachev, Sean “Diddy” Combs, Wayne Newton and Larry King. This month's Town Hall meeting was held Monday, April 28, at 7:00 pm in the Lilburn City Hall auditorium located at 76 Main Street. The topic was current and future plans for redevelopment in Lilburn. About twenty-five residents attended. Mayor Crist, City Manager Bill Johnsa, and Economic Development Director Doug Stacks presented several projects that are either underway or in the pre-engineering stages. Noted projects that are underway: Main Street Realignment which will eventually include sewer, underground utilities or utilities relocated off the street, new water mains and stormwater drains, pediestrian/bicycle sidewalks down Main Street. These sidewalks will eventually tie into the pedestrian/bicycle sidewalks that the Lilburn and Gwinnett Village CID's are planning that will start at Beaver Ruin Road in Norcross and continue along Indian Trail Road in Lilburn. The City Manager also commented on the County Lilbraryt/City Hall project stating that the City is hopeful for a fall groundbreaking for the complex. Click HERE for a rendering of the proposed Library/CityHall. Other items of note were that the City has received its franchise deposit of $450,000 from Big League Dreams and that there is no interest in a ball park on the site. Doug Stacks indicated that the City's priority is to market the 7+ acre tract resulting from the Main Street Realignment, which the Downtown Development Authority owns. The vision is that a mixed use plan reflecting city archtectural standards will drive future re-developement in the "Old Town" city center near the park as well as in "New Town" which includes the old Water Treatment plant. Additionally, the half finished building on the corner of Pleasant Hill and Lawrenceville Hwy. has been bought by Aldi Foods and will be demolished and a new site plan will be submitted. Another building that will be demolished is the old maintenance building on Railroad Ave. This will make way for redevelopment of the block for mixed use, which was considered before the recession. Also, once the City Hall is relocated, the current municipal complex will be occupied solely by the Police Department The exterior will be renovated to reflect the architechture of the older buildings on Main Street. There are also plans to look at sidewalks along Lula and Poplar. There were other projects mentioned as well. If you are interested in learning more, make plans to come to Business After Hours on May 15, (see related article). 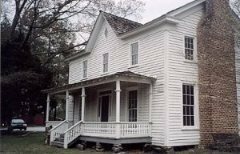 Come out on Saturday, May 3rd, 9 am until 1 pm to the Wynne Russell House Treasure Sale and House Tour. This is the first of a summer series of sales featuring crafts, baked goods, collectibles, house wares, childrens clothing and toys. Refreshments will be available for purchase. Sale will start at 9 am and the tours will start at noon. The house, located at 4685 Wynne-Russell Dr, is on the National Historic Registry. Booths are availabel for a fee; for registration and info check: www.lilburnevents.com. Rentals benefit the Wynne Russell House. The May Business After Hours sponsored by LIlburn Community Partnership will be held at the City of Lilburn Public Works Facility on Thursday, May 15, from 5:30 - 7:00 pm. Recently, the facility has been relocated to 4428 Lilburn Industrial Way. In addition to a quick tour of the facility, City officials will be on hand to update attendees on City and CID projects and future plans. So much is happening in Lilburn, this will be an excellent opportunity for residents and business owners to get up to date information. BAH is free. Businesses are welcome to bring a door prize and will have the opportunity to introduce their business as they host the drawing. For more information, contact info@lilburncp.com. For past BAH photos, check the LCP Facebook photo album. 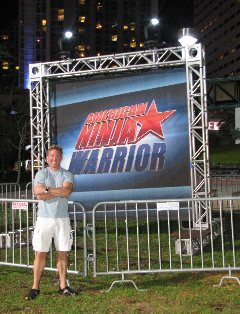 Lilburn area Doctor Robert Pruni is vying for another shot on the NBC hit television show American Ninja Warrior. This is his second season and he is looking forward to being the first American to beat the World's hardest Obstacle Course. Dr. Pruni is the owner of CrossFit Lilburn 678 and is one of the trainers who coaches CrossFit. Other services include Yoga and Personal Training. The facility also accommodates Stunt Pre-Vis, Air Ram, High Fall and Air Bag set-up as well as a Green Screen wall. Additionally it offers specialized Ninja, mud run and obstacle course training. Check out the sixth season of American Ninja Warrior on NBC, Monday May 26th and see if Dr. Pruni, "America's Fittest Doctor" can achieve "Total Victory." This summer, the City of Lilburn will host a new weekly farmers market in Old Town focused on fresh, local produce. The Lilburn City Market on Main will be open Tuesday evenings from 4-7 p.m. in June, July, and August in the Greenway parking lot on Main Street. Applications are now being accepted for vendors interested in selling at the City Market. Products sold at the City Market must be grown or made by the vendor. The City will conduct farm visits to ensure that only authentic, high-quality produce is sold. Vendors are invited to download an application online or contact City Events Coordinator Roz Schmitt. Make plans now to attend PAWfest to be held in Lilburn City Park. PAWfest was voted one of Gwinnett's Best Local Festivals in Gwinnett Magazine's Best of Gwinnett in 2010, 2011 & 2012! Voted one of Best Social or Charity Events in 2013!The City of Lilburn is excited to be partnering with the Gwinnett Humane Society for PAWfest 2014! PAWfest is designed to raise community awareness about animal-related issues through a collaborative effort among area organizations dedicated to animal welfare. The day will include canine demonstrations, pack hike, vendors, raffle, dog contests, silent auction, and much more! The City of Lilburn is taking spring and summer reservations for Gartrell Nash Pavilion in Lilburn City Park. Also, don't delay reserving a space for the White Elephant Sale to be held on Saturday, June 21, 9 am - 2 pm. Other City events that are in the works are: Hiking and Hotcakes to Cure Scleroderma on June 14, Sparkle in the Park on July 4, and National Night Out on August 5. Check the City web site LINK. For more info on City News, visit the web site as well as Facebook. Easter Egg Hunt Was Awesome! 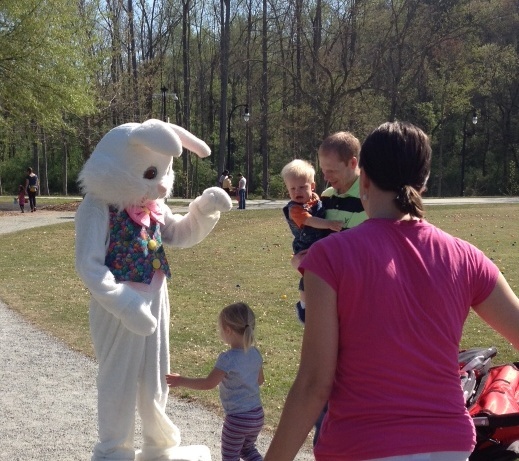 This spring's Easter Egg Hunt sponsored by the Lilburn Downtown Development Authority was the best ever. Volunteer event coordinator Jimi Taylor and her volunteers hosted 1500 children and parents at this year's event. The weather was great, and the Easter Bunny happily greated and posed for memorable pictures. Thanks to Jimi and her volunteers for continuing this great Lilburn tradition. The following sponsors also helped make this year's Egg Hunt possible. A heart felt thank you to: Antiques in Old Town, Brandy's at 97 Main Hair Salon, St. Matthews Preschool and Kindergarten, Trickum Middle School Odyssey of the Mind, Elmer Nash Family, Lilburn Woman's Club, Lilburn Community Partnership, and the City of Lilburn. 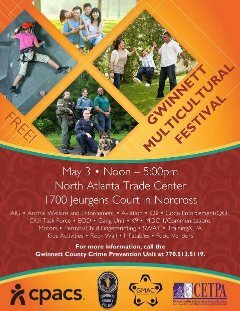 Gwinnett County Crime Prevention Unit at 770.513.5119. Please join the Solid Waste Division on Saturday, May 10, 2014, at Coolray Field, home of the Gwinnett Braves as we celebrate Mother Earth by hosting a free recycling event. This event will feature electronics recycling ($10 cash fee per TV), tire recycling (limit eight tires per vehicle; no dealer tires), and paint collection (limit five one-gallon cans per vehicle; no paint thinners, stains, spackle, oil paint cans, rusted paint cans, or dried-up paint). Please bring your gently used or old sneakers to be donated to those in need or recycled into surfaces for local playgrounds and running tracks. Residents can enjoy free kids’ activities and touch-a-truck, and will have the opportunity to meet their haulers. Registration opened March 1 for summer camps covering a variety of topics such as science, music, nature, history and daycare. Click on the age groups below for registration information. Gwinnett County invites you to participate in the identification of needs and funding priorities for its Consolidated Plan 2015-2019. Your input is also needed in helping staff develop a newAnalysis of Impediments to Fair Housing Choice. The last of three meetings to receive public input will take place on Thursday, May 1, 2014 at 10:00am & 6:00 pm at the Gwinnett Justice and Adminsitration Center, 2nd Floor, conference Room C & A, 75 Langley Dr. Lawrenceville, GA 30046. Unable to attend the meeting? Complete the survey by May 30, 2014 at www.surveymonkey.com/s/7YL8YL3. Your input will inform and help provide guidance for HUD Entitlement Grant funding and fair housing planning in Gwinnett County for years to come. Interested in having fun, helping a good cause and possilbly getting qualified to run in the Peachtree Road Race? Make plans now to participate in the Fourth Annual St. John Neumann S.M.I.L.E 5 K and 1 Mile Walk to be held in Lilburn City Park on Saturday, May 17. Registration information on www.active.com and this LINK. Also, check the S.M.I.L.E. website for more information. Plans are being made by the Lilburn Community Partnership and SafetySmart Lilburn for Small Town. 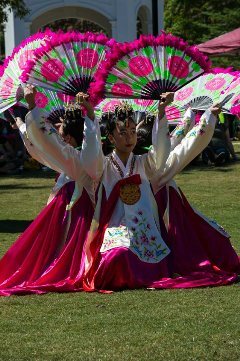 Big World: International Food and Music Festival to be held in Lilburn City Park on Saturday, September 13. The event committee would like to encourage businesses and organizations in the greater Lilburn area to come forward and support this event with sponsorships, vendors, entertainment, volunteers, participants and attendees. if you would like to help make this event a community success, save the date and contact info@lilburncp.com Check LilburnEvents.com and Facebook for updates. Wednesdays - $25 Family dinner. Check their Facebook page for updaes. 107 Main St. Lilburn, 770-6911. Cincio de Mayo celebration May 3-5, Sat- Mon. If you want to learn how to make your own beer, wine, cider, and mead it's easier than you think. Contact Lilburn Home Brew to sign up for a free classes. Email LHB@LilburnHomeBrew.com, or call 770-638-8383. For more info, see www.lilburnhomebrew.com. Plant Sale 40% off, Friday thru Sun. May 2, 3, & 4. Fri. - Sat. 8 am - 5 pm, Sun. 12-4 pm. 5444 Lawrenceville Hwy. Call for Info Tickets, and Pricing. June 23 - 29, Summer Music Camp for ages 8-18. Oteil Burbridge (Allman Brothers) will be on hand to teach individual lessons and help the bands prepare for their performance! 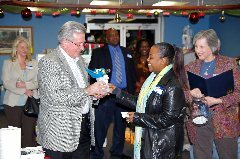 Lilburn Business Assoication (LBA) has a busy month planned. Friday, May 1 starting at 8:am is Business Builders Breakfast which features Elisa Kadish of Gwinnett County Public Libraries speaking on Business e-Resources in the Library. Attendees should bring a laptop or tablet and their library card so that they can access members-only library databases. The breakfast will be held at Casa di Pancake in the Publix Shopping Center on Five Forks Road near Killian Hill Road. Attendees will order off of the menu. Breaksfast without a drink starts at $4.99. The May Business Luncheon meeting will be at Killian Hall on Tuesday, May 20 starting at 11:30 am. Election of Officers will take place and the featured speaker will be Mark Butler, the Georgia Department of Labor Commissioner. Commissioner Butler's efforts have been focused on improving the agency’s relationships with employers, job seekers, and Georgia’s future workforce. For more information on the LBA, click this LINK. LWC Conservation Department celebrated the Great American Clean-up and Earth Day by inviting the community to help spruce up the Lilburn Post Office grounds. In addition to clubmembers, ROTC and Beta Club members from one of the high schools and Knights of Columbus volunteers joined in the effort. Club members will be selling tickets ($20) to their June 7 Garden Tour and their newly released cookbook , Lilburn Cooks Fresh ($15) at the Wynne-Russell House Treasure Sale Sat. May 3 from 9 -1 pm at 4682 Wynne-Russell Drive. GCPS: On Course for Continued Success? GCPS has earned the reputation as a high-performing school district that provides a quality and effective education for every student. To sustain our success, we must continuously review where we are and envision what the district must be in the future. In 2014, GCPS is revisiting its vision, mission, and strategic goals. Please take this online survey and provide your input into this process. Act now to volunteer as a Career Day Speaker for Lilburn Middle School's Career Day on Wednesday, May 15. Share your career highlights with students at this important time in their education. Your sharing of your career experience will help make a difference as they make decisions on choosing a career path. Click this LINK to download a letter from the school and contact info from the career day coordinator. Special registration forms for drivers education classes can be picked up outside the Community School Office located in Building M. These forms are also available online. During the summer, classes meet for 4 days from 8 AM - 4 PM Monday-Thursday. At the conclusion of the classroom portion, students will have scheduled appointments to complete 6 hours of behind the wheel instruction. A photocopy of the student's learners' permit, the completed application, and $345 fee is due no later than one week before class begins. Enrollees can also practice their driving skills on the Community School's driving simulator. Dates and price are subject to change. The next sessions are: June 2-5, June 16-19, and July 14-17. Parkview Community School offers a wide-range of activities for all ages. For a complete list of classes AND summer camps, go to the office or look online at http://parkviewcommunityschoolonmycalendar.com. To be added to Parkview Community School e-mail, please e-mail us at: parkviewcs@yahoo. May13, 8:15am-9:30 Lilburn Community Partnership Board meeting, CID office @ 4566 L'ville Hwy, Suite 220. Wed. May 14, Lilburn Arts Alliance will meet in Lilburn City Hall at 7:pm. check their website for more information. www.lilburnartsalliance.org. Friday, June 6, 4-8pm Lilburn Farmer's Market at Good Shepherd Presbyterian Church at 1400 Killlian Hill Rd. Contact: info@lilburnfamersmarket.org. Still time to Take the Pledge: Click Below.